With more than 12 points of articulation, these action figures are the most highly detailed and articulated Turtle figures ever made! Each character is uniquely sculpted, with heights ranging from 4.25 inches to 5.25 inches, to capture the individual personalities of the characters from the Teenage Mutant Ninja Turtles TV show. Each figure comes with their signature weapons. Donatello is the inventor within the Ninja Turtles team and a master weaponeer. Your little one can recreate favourite episodes from the popular TV series with this action figure. 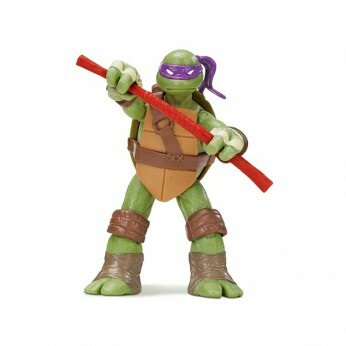 With his ninja arsenal, Donatello takes on the enemy and wins! Turtle Power! A Ninja Turtle figure with brilliant detail. Complete with signature weapons; Collect all 4 Ninja Turtles and all the other characters from the show. Compatible with other Teenage Mutant Ninja Turtles playsets. One supplied; For ages 4 years and over; EAN: 43377905028. WARNING(S): Not suitable for children under 3 years old. Only for domestic use; To be used under the direct supervision of an adult. This toy costs approximately £7.99 (for the latest and best prices make sure you check our retailer list for the Turtles Action Figure Donatello above). In our review of Turtles Action Figure Donatello we classed it as being suitable for ages 3 years, 4 years, 5 years but recommend you check the manufacturer specific advice before purchasing.